About meI am a retired lawyer living in San Diego. I have been married 44 years and have two adult children. 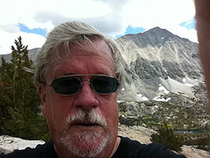 In addition to books, my passions include: playing the guitar, cooking, and hiking, fishing and skiing in the Eastern Sierra where we have a second home. About my libraryMy tags speak for themselves. I only collect books by writers I like or on subject matters I like. I do not collect bindings or first editions; nor am I a completist because even my favorite writers produce some clunkers. I have read nearly every book in my catalog with the exception of some of the more turgid and prolix classics. I also have a passion for science fiction; however, I generally buy used paperbacks which I do not keep and which therefore are not catalogued. I generally prefer nonfiction; however, I collect books on inspectors/detectives who live in my favorite cities or locales, including Maigret in France, Montalbano in Sicily, Bruno in the Dordogne, and Brunetti in Venice. Within the last several years I have been cataloguing my music collection. Create your own visitor map!